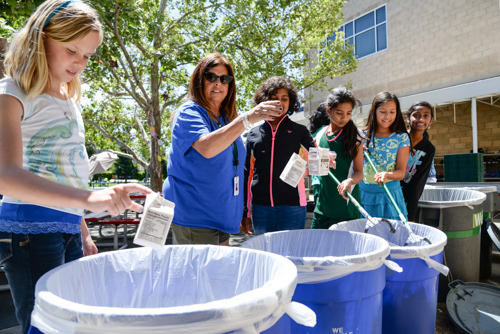 Harker recently instituted a new schoolwide waste program that separates waste into “wet” and “dry” categories. The initiative coincides with a system rolled out by the city of San Jose and Republic Services, which manages waste for commercial users in the area. Labeled cans have popped up on every campus, along with signs indicating what kinds of waste go in each can. “Wet” waste includes food waste and used paper goods, such as napkins, tissues and paper food trays. “Dry” waste includes drink containers, clean paper and cardboard, and non-compostable food containers. The labeled cans were set up during spring break in classrooms and strategic spots on each campus. Green Committee members have been working to get the word out. Lower school students were informed about the rollout during educational assemblies, and on April 22 – celebrated around the world as Earth Day – faculty and staff wore green and blue to show their support of the wet/dry program. Meanwhile, middle school students have taken quizzes about the wet and dry classifications during their advisories. Upper school students were informed of the new procedures at the April 14 morning school meeting with a special video and presentation. A bulletin board display in the lunch area, featuring amusing photos of costumed students, also reminds students of the proper way to dispose of their trash.